Ships operating off the east coast of the Americas in the 1700s and 1800s were often attacked by pirates. Many pirates were rogues who plied their trade for plunder and profit. Others were privateers, who were issued a commission, called a letter of marque, by one of the major sea-powers (Portugal, Spain, France, England, Holland, and later the United States) to prey on the vessels and settlements of their enemies. Privateers generally regarded themselves as lawful patriots of their countries. Lines were often crossed, however. Privateers sometimes had their commissions revoked and continued to operate as pirates, while successful pirates were sometimes granted commissions. The West coast was largely free from pirate activities, because with the exception of Spain, the major sea powers of Europe had very little presence. Hippolyte de Bouchard (also known as Hipólito Bouchard) was a notable exception, and is often called California’s only pirate. Bouchard was born in France circa 1780. As a young man, he served in the French merchant fleet. In 1809, he moved to Argentina (which was then called the United Provinces of the River Plate). By 1811, he was serving in the Argentine revolutionary navy, and also took part in land battles. 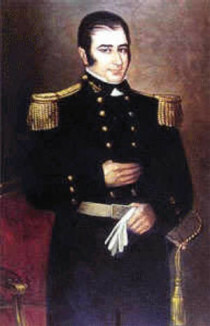 He was awarded Argentine citizenship in 1813, and was given a naval commission in 1815. 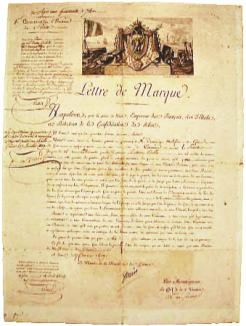 In 1817, Bouchard set off on a journey around the world, bearing a letter of marque allowing him to attack Spanish ships and settlements. It is on this journey that he raided the missions of California. On November 20, 1818, Bouchard attacked the Presidio at Monterey. The Spanish had seen the approach of Bouchard’s two ships, and fought them off with artillery. On November 24, the pirates landed 200 men, and attacked the fort from the land. They quickly overcame the defenders, and held the Presidio for 6 days before leaving. During that time, they stole cattle, weapons, and other valuables, and burned down the fort and much of the surrounding town. On December 5, the pirates landed a force near the mission at Santa Barbara. The men raided and burned an outlying ranch, but when they approached the mission and presidio, it appeared to be heavily defended, so Bouchard decided to abandon the attack. There is an unconfirmed anecdote that the soldiers at Santa Barbara sent out men on patrol, wearing different uniforms each time, to convince the raiders that the mission had several times the number of defenders that were actually present. On December 16, 1818, the pirates moved on to San Juan Capistrano, where they demanded supplies and ammunition. The Spanish defenders refused, so Bouchard once again landed a force and attacked the mission. They quickly seized the town, and, after taking ammunition, supplies, and valuables, set fire to the town’s houses, but spared the mission. After the raid on San Juan Capistrano, Bouchard sailed south to Mexico, never to return. However, his successful raids badly frightened the Spanish missionaries. Some missions, such as San Buenaventura, moved their herds and valuables inland in case they were attacked. Bouchard continued to raid Spanish settlements and sieze Spanish ships in Mexico, until the end of his voyage on April 3, 1819. 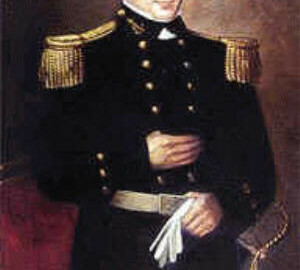 In 1820, Bouchard joined the Peruvian navy, and in 1829, he was made Admiral and commander of that navy. He retired the following year. In Argentina and other countries of South American, Hippolyte de Bouchard is regarded as a patriot and hero; streets and monuments bear his name. He was even commemorated on an Argentine postage stamp. But for the early settlers of California, he was a dreaded pirate!